Why "Spider" Keyer? If you do contesting you know that there is never enough place on the table. This keyer was designed so small and lightweight that it can hang on the cables somewhere behind the table. In the same way as a spider hangs on its web. For the small size it is suitable for SOTA and similar activities as well. Spider Keyer was mainly developed as a companion to HamRacer logging software. Manufacturing the front and rear labels. 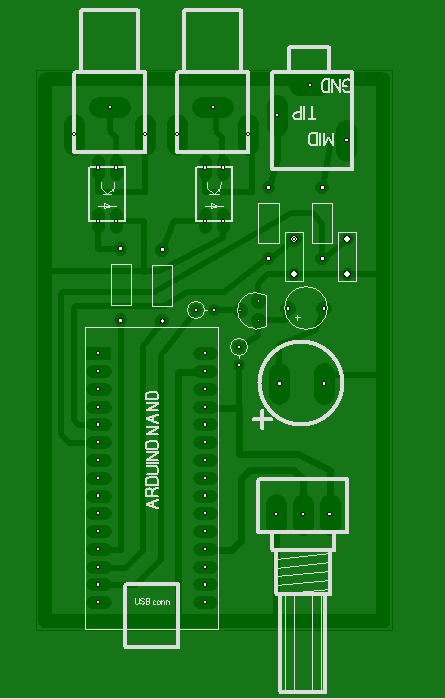 PCB, top view, with Arduino Nano attached. 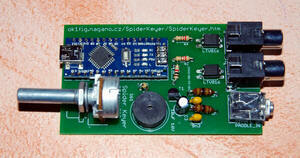 mobile charger (5V via USB). The aluminium box is: HAMMOND HA1455C802. To communicate with Spider Keyer set a COM port to: speed 57600 bps, no parity, 8 data bits, 2 stop bits. Each command consists of two consecutive bytes. Byte1 determinates the command, Byte2 carries optional data. The unit stores the command into an internal buffer when it is received. It is the same buffer where it stores characters to send. It is executed when it is its turn while playing the buffer. If the command is preceeded with byte with the value 27 (Esc) then the command is not stored into the buffer but it is executed immediately when it arrives. immediate - send Char(27) + Char(3) + Char(20) - to change the speed to 20 wpm. The unit can receive the command at any time all, even during sending, both automatic and manual. The change happens immediatelly. Some of the commands change values that the keyer will use until it is changed again or the keyer is restarted (typically the lead time). You will probably send a sequence of these commands once right after connecting to the keyer. Hint: after connecting to Spider Keyer you may first send a sequence of startup command and, as a last item, you enable sending the reporting bytes (see further). >0: PTT ON Switch PTT on and off. 2: Key down and toggle PTT (incl. lead time) Push the key or release it. 4: speed potentiometer If the bit is set the feature is enabled. If the bit is cleared the feature is disabled. >0: paddles do trigger PTT Determines whether manual sending will trigger PTT. sending, in 10 Hz steps. 17 Any Retrieves a short textual information from Spider Keyer. 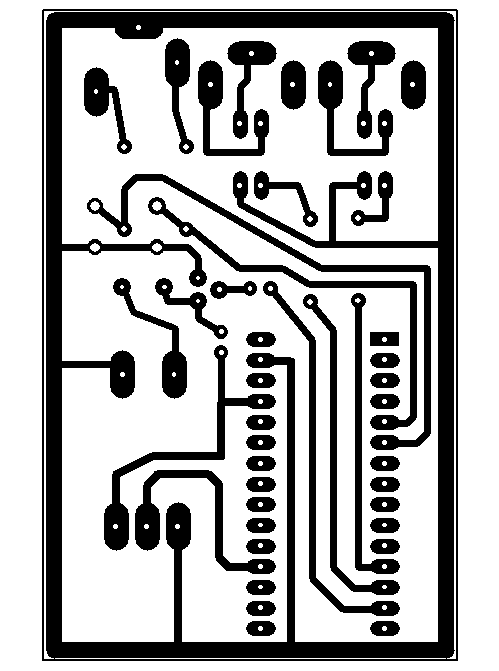 18 Any Emits a short high-pitched beep by the buzzer on the PCB. 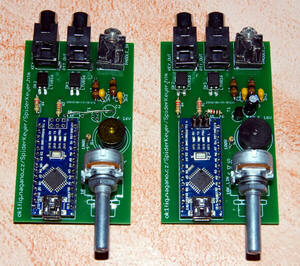 The keyer can send back reporting bytes. This way the unit can inform the controlling PC application of some events. 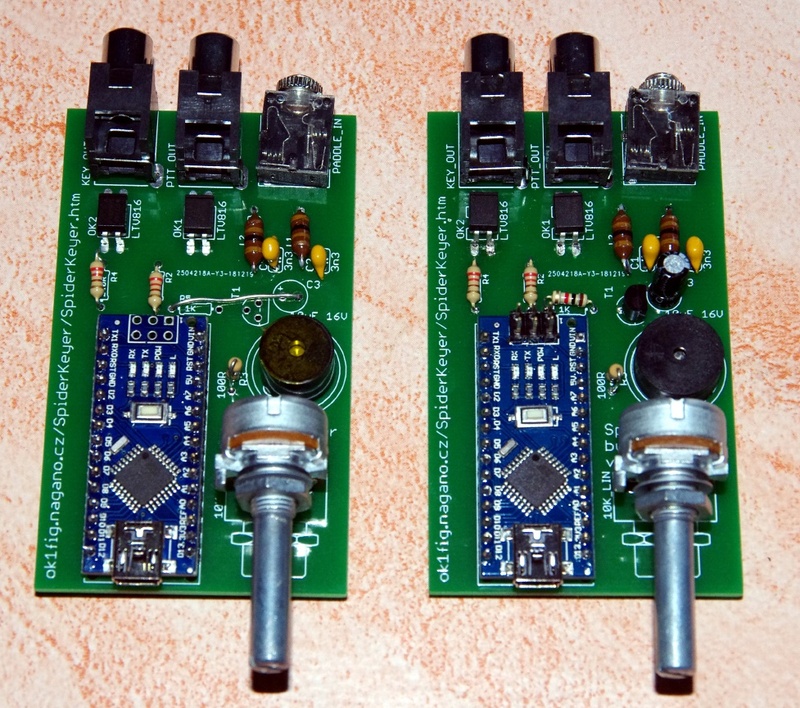 For example, the user changed the speed by rotating the speed potentiometer. For each event it sends two consecutive bytes. The sending reporting bytes must be enabled first by the command CMD_SET_FEEDBACK. The command CMD_PING retrieves the reporting bytes unconditionally. For example, if the controlling PC application needs to learn when the sending is over it must trap bytes with bit 7 set (which indicates that it is the first reporting byte). If both bits 4 and 5 are cleared in this byte it can be reliably assumed that no transmission happens any longer.